These elegant antique style earrings are fashioned as four petaled blossoms set with fine faceted diamonds. 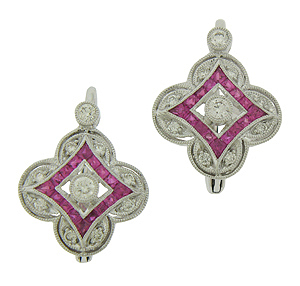 A diamond figure set with square cut rubies stretches into the center of each milgrain edged petal. 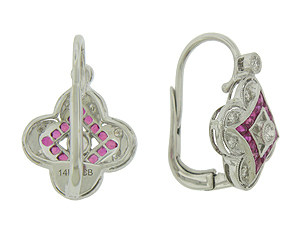 Finished with European backs, the earrings are fashioned of 14K white gold and measure 1/2" in diameter.